The Zygo Soccer Report: Goodbye DeRo. Hello Landin? It's been a week now since the Houston Dynamo dropped the somewhat shocking news that they had traded star midfielder, Dwayne De Rosario, to Toronto F.C. for young defender Julius James and roughly $200,000.00 in allocation money. Most Dynamo fans knew that DeRo was interested in returning to his homeland now that they were represented in the MLS, and it didn't hurt that his hometown of Scarborough, Ontario is essentially a suburb of Toronto. What most Dynamo fans didn't expect was this early of a departure by one of the players who quickly became one of the faces of the Dynamo franchise. I for one, and I could be wrong, don't expect DeRo's Toronto tenure to last very long. I could see him there for a season, or maybe half a season, before he tries his hand at football on the European continent. Sadly, since last week's announcement, DeRo has been all but absent when it comes to press availability here in Houston. We couldn't get him for this past Monday's show on 1560 The Game, and even Glenn Davis had to resort to a simple email on his show this past week. With the departure of both DeRo and Nate Jaqua, it seems that one of the Dynamo's biggest chores this off-season is signing an offensive threat. Enter stage left - Luis Angel Landin, Pachuca's 23 year old striker, who was loaned to Monarcas Morelia. Unlike Franco Carracio, Dynamo Coach Dominic Kinnear has see Landin's play first hand, and he was impressed. It seems that the Dynamo are quietly in active talks with Landin's representatives. Landin has been capped by the Mexican National Team and is considered one of the young, rising stars of Mexican football. What does it mean if Landin comes to the Dynamo? Unlike Chicago's Blanco, Landin is young and hasn't developed a huge following, so his signing won't bring as many FMF fans to Estadio Robertson as Blanco has brought into Toyota Park for the Chicago Fire. That being said, the Dynamo have done a good job of creating a strong, local fanbase so that isn't the main issue or even a focus for the Dynamo when it comes to signing talent. In my mind, if the Dynamo sign Landin, it could be a watershed moment not only for the Dynamo, but for MLS on the whole. If Landin comes to play for the Dynamo, it would mean that a young, developing talent from a major U.S. rival. Yes it's nice to have the likes of developed foreign talent like Blanco, Guillermo Barros Schelotto, Juan Pablo Angel, and Beckham, but with Landin, we're talking about a young player with much potential. And as long as Sven is in charge in Mexico, playing in the MLS won't hurt Landin's shot at national glory. 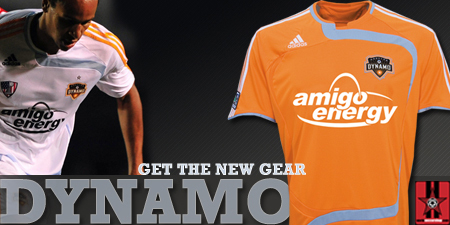 Dynamo fans might get the opportunity to see Landin in action in the near future. Both Morelia and Pachuca will be at Robertson Stadium on Monday January 5, 2009, playing in InterLiga. Maybe Landin's presence in Houston just after the new year will help the Dynamo get this deal done.